Abysskiss. What a fantastic word. And so multi interpretable. Just use your imagination what it could all mean. Adrianne Lenker must have thought of a few by now. Her solo album was released recently. It is a small, contained and modest album. Just Adrianne, her voice and guitar. Delicate fingerpicking and a highish, thin voice. The contrast is that in all that softness and delicate playing the music is confrontational. There is nothing much relaxed about Abysskiss. Ms. Lenker still has some inner demons to put to rest. Like most younger people do, though most do not have the talent to it in this beautiful way. In music this album is very much in line with Anne Tivel's album 'Heroes Waking Up'. In playing it is far from the sweetness that covers Tivel's album. 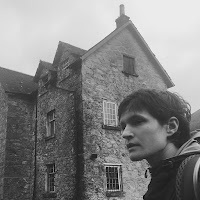 Adrianne Lenker may sound sweet, but whether she is, as a musician and singer, I sincerely doubt it. For that her lyrics are to confrontational and self-doubting. This is all about inner-searching and not e.g. caring about the well-being of a father who goes out fishing in his boat. Death, relations, it all comes by. Somehow I'm often remembered of Courtney Barnett. Certainly when the sound is expanded in 'Out Of Your Mind'. Next to her solo career Lenker sings in the NYC band Big Thief, a band two records into its career in the folkrock segment. With a lot more guitars and stuff involved. First impression? Start listening to 'Masterpiece' also. The purpose of the solo records is to show songs at their barests and "to shed some skin", as she formulates it. It may well be that recording solo as well allows her to be more personal in the songs. As such it seems to me that she succeeded. Abysskiss is no easy listening, but very much worthwhile to do so. Adrianne Lenker invites her listeners to be drawn into her world. Those who do are treated to a gem like 'Cradle'. Dark guitar notes, a voice and some humming is all it takes to tell a story (o.k. with a few things going on in the background in parts). As thin and transparent as a ghost, as soft as silk 'Cradle' is. For me it took a second listening session to get past my first impression of the thin, slightly whining voice. From that moment onwards a world opened itself. A world of ethereal beauty in which a singer-songwriter bares herself to the world. Things seldom get more intimate on a record.